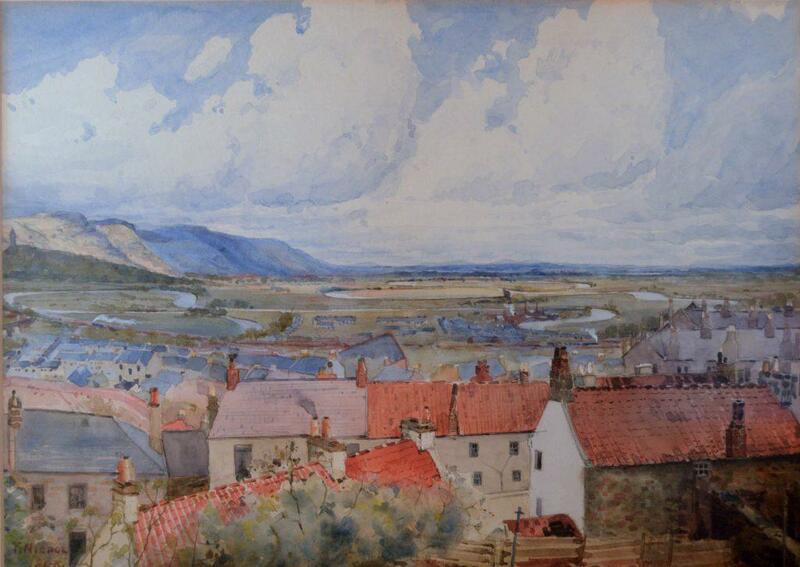 This watercolour of 1908 is a new gift to the Stirling Smith collections by Susan Power. Nothing is known of the artist T. Nichol. He is absent from the usual exhibition lists and art dictionaries, but this work shows him to be an artist of considerable talent. The view point is from the wall on the Castle esplanade, looking east to the Ochils, the windings of the Forth and Alloa. Of immediate interest below the wall is the picturesque row of red pantiled houses, which are long since demolished. There is every likelihood that the pantiles were made locally, either in the Stirling pottery or at Throsk, both of which were run at one time by the Christie family. In the middle distance of the painting, trains can be seen travelling in opposite directions to Alloa and Stirling Station, and the factory chimneys on Forthside are belching smoke. From the time of the inception of landscape painting, Stirling was a destination for many British and European artists, most of whom wanted to capture the grandeur of Stirling Castle, Craigforth and the Abbey Craig. The painter of this scene has opted for a more domestic view, and T. Nichol was probably one of the good, but unrecorded artists who lived in Stirling. I would be interested, if you have since found out anything about the artist T Nichol. I have an oil painting by a T. Nichol dated 1954, and wonder if this could be the same painter. Nothing has come to light. It’s a possibility that yours could be by the same artist. Is it of Stirling? Can you post a copy of the image? Many thanks. My mother has 2 paintings by T. Nichol. Mum and Dad brought the watercolours when they were on honeymoon in Scotland in 1949. One picture says near West Kilbride. Both are signed T Nichol. These paintings have been in Jersey, Channel Islands since they were bought. I too have a T Nichol watercolor of Dunure harbour. I got it from my mother in law 30years ago. No nothing of artist.